BANGKOK: The golden Buddha statues, amulets and lucky charms that festoon Sakuntala Mettawong’s tiny Bangkok cellphone shop are not helping business. It’s peak time, but customers are scarce at the usually bustling mobile phone bazaar in the MBK Center, which sits on the fringe of a mile-long cluster of gleaming malls that symbolise the rapid growth of Thailand’s consumer class. “Business has been very bad. Many shops have left here, some moved to find cheaper spots or changed hands,” said Sakuntala, almost drowned out by the noise of bored shop owners playing computer games behind her. An economy known for its dynamism is ailing, headed towards recession and held hostage by another crippling bout of turmoil in an eight-year power struggle being fought in Bangkok’s commercial heart and in its politicized courts. The intractable crisis centres on the political dominance of the billionaire Shinawatra family, and the slim prospect of a resolution has been sapping consumer confidence, which sank in February to a 12 and a half-year low. Economists say five months of sporadic violence and anti-government blockades that have scared off tourists could cost 300 billion baht (US$9.3 billion) in lost revenue. Some businesses fear the Teflon coating on what’s for years been one of Asia’s most resilient economies could finally be wearing off. “Consumers have no mood to spend. 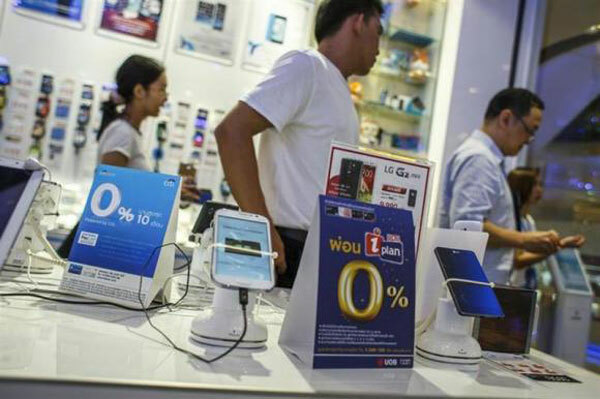 We’ve seen demand falling in every segment of our products,” said Boonkiat Chokwatana, chairman of consumer product distributor ICC International Pcl, which saw first-quarter sales fall 20 per cent. With legal cases stacking up against Prime Minister Yingluck Shinawatra, the confrontation pitting royalists, tycoons and scions tied with the old and new political orders against each other could get much worse. Yingluck’s mostly rural, working class supporters are convinced powerful forces in Thailand’s establishment are conspiring to overthrow her, most likely via a court ruling, and they have vowed to fight back. The outlook for the economy looks just as grim, with some economists forecasting growth of less than two per cent or even contraction if growth of exports, worth 60 per cent of gross domestic product (GDP), falls short of the 4.5 per cent forecast by the central bank. The International Monetary Fund (IMF) last week projected growth of 2.5 per cent this year, the slowest among Asian economies and less than the 2.7 per cent seen by the Bank of Thailand following two revisions since October, when tension resurfaced.